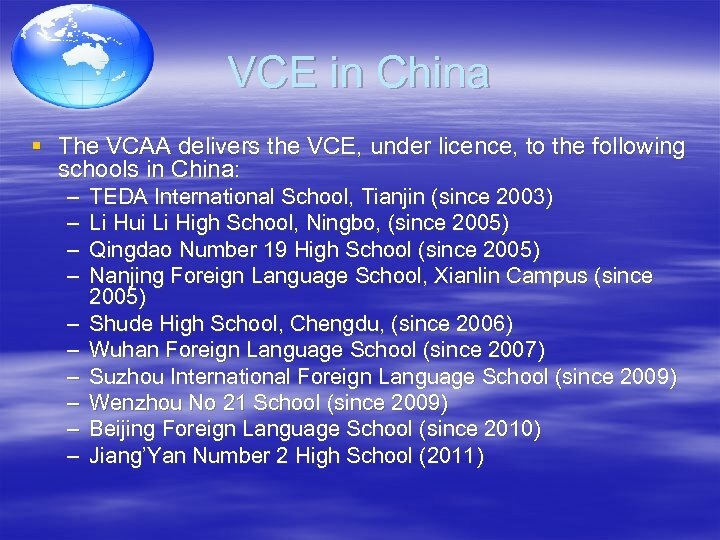 VCE in China § The VCAA has been delivering international education programs since 1999. 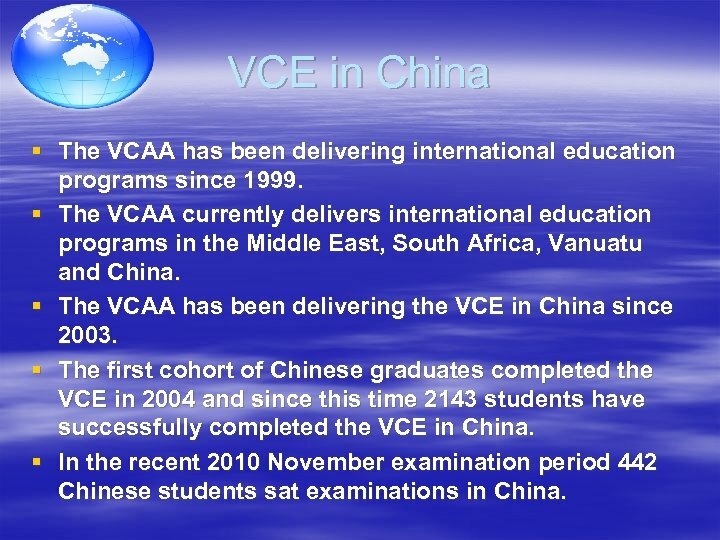 § The VCAA currently delivers international education programs in the Middle East, South Africa, Vanuatu and China. 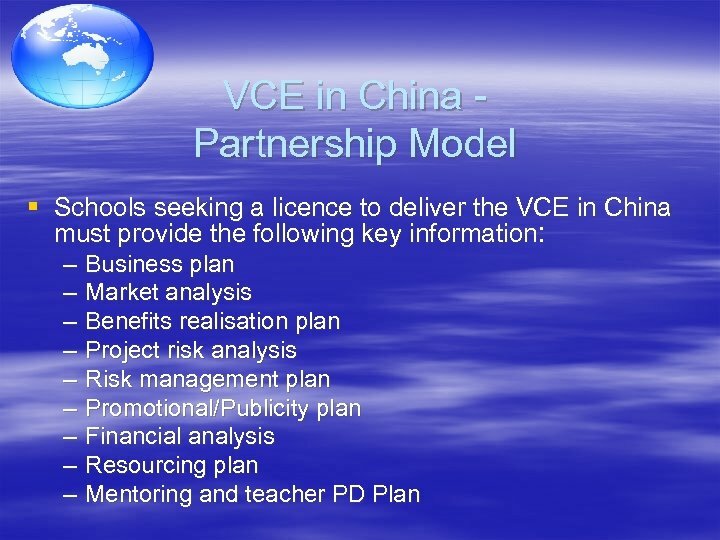 § The VCAA has been delivering the VCE in China since 2003. 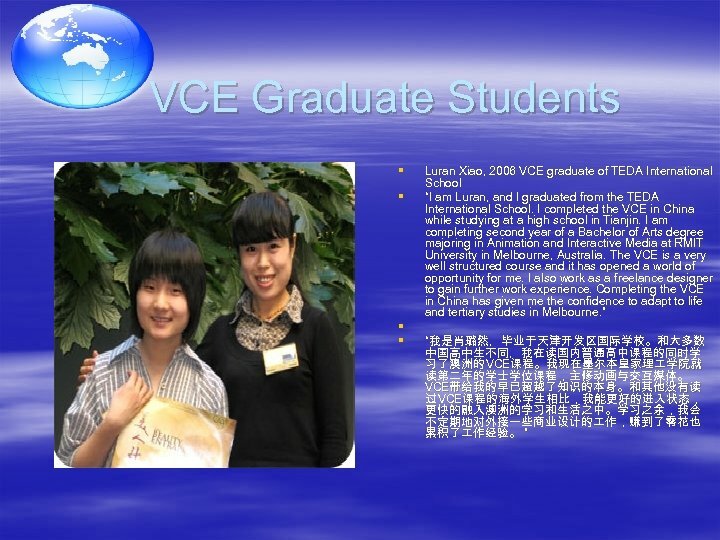 § The first cohort of Chinese graduates completed the VCE in 2004 and since this time 2143 students have successfully completed the VCE in China. § In the recent 2010 November examination period 442 Chinese students sat examinations in China. 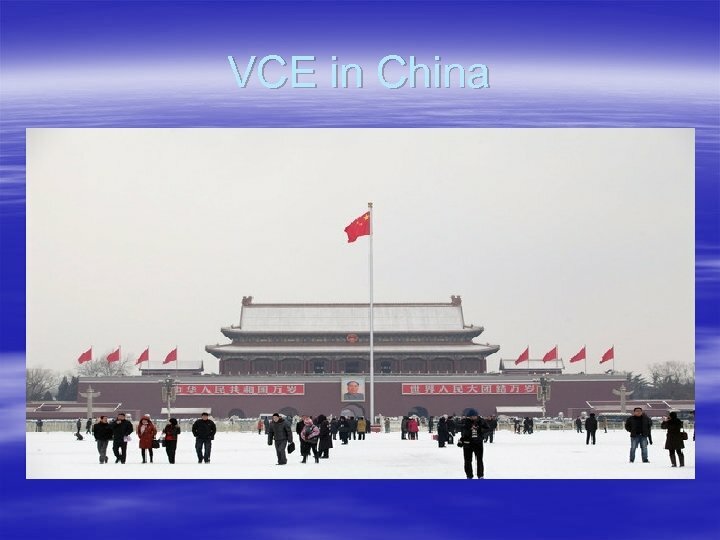 VCE in China § The VCAA has developed strong professional relationships with the Chinese schools and Education Authorities where the VCE is delivered. 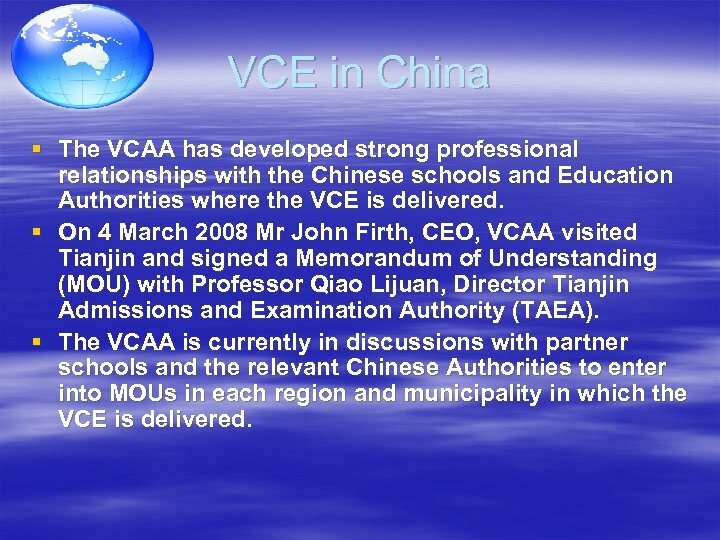 § On 4 March 2008 Mr John Firth, CEO, VCAA visited Tianjin and signed a Memorandum of Understanding (MOU) with Professor Qiao Lijuan, Director Tianjin Admissions and Examination Authority (TAEA). 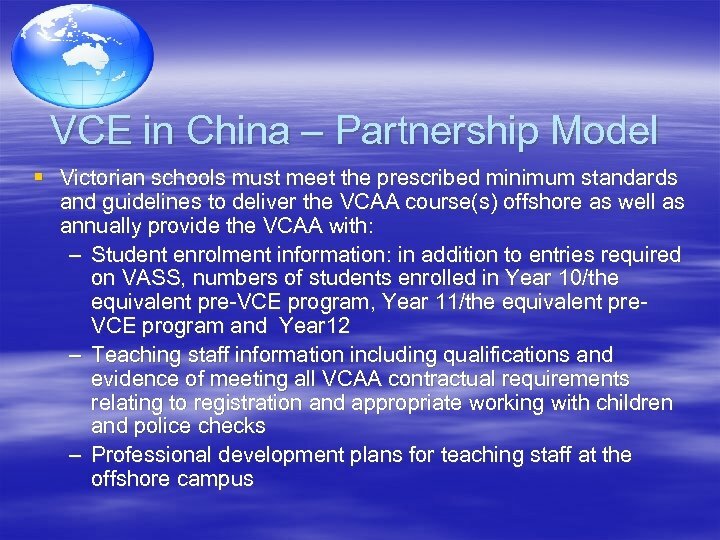 § The VCAA is currently in discussions with partner schools and the relevant Chinese Authorities to enter into MOUs in each region and municipality in which the VCE is delivered. 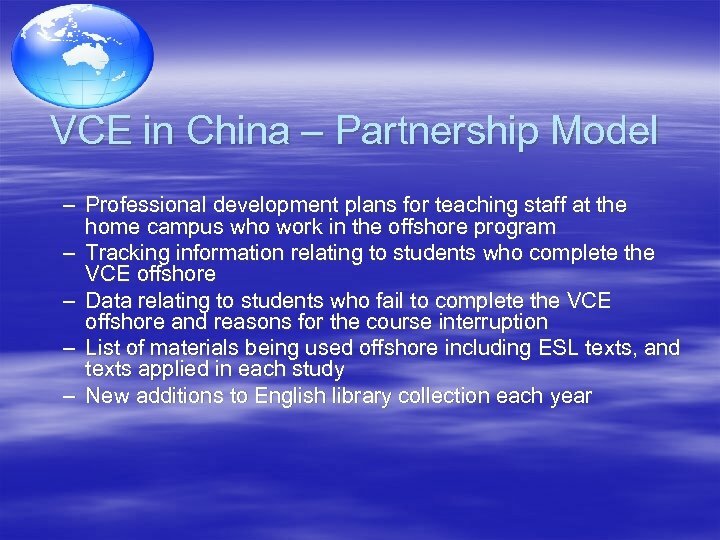 VCE in China § The VCAAs offshore programs are not large scale compared with other international education providers. The reasons it is not large scale include: – The VCAA only seeks to deliver high quality programs to ensure quality outcomes for students, teachers and schools involved in the programs – The VCAA is not a business, it is a government agency. 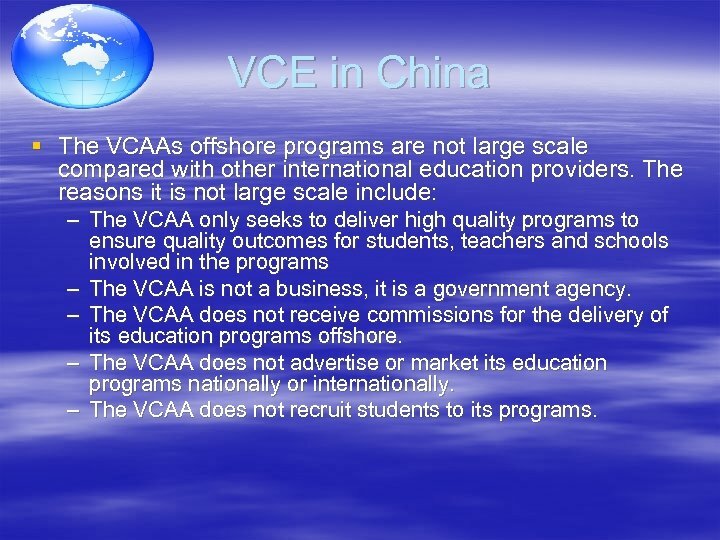 – The VCAA does not receive commissions for the delivery of its education programs offshore. 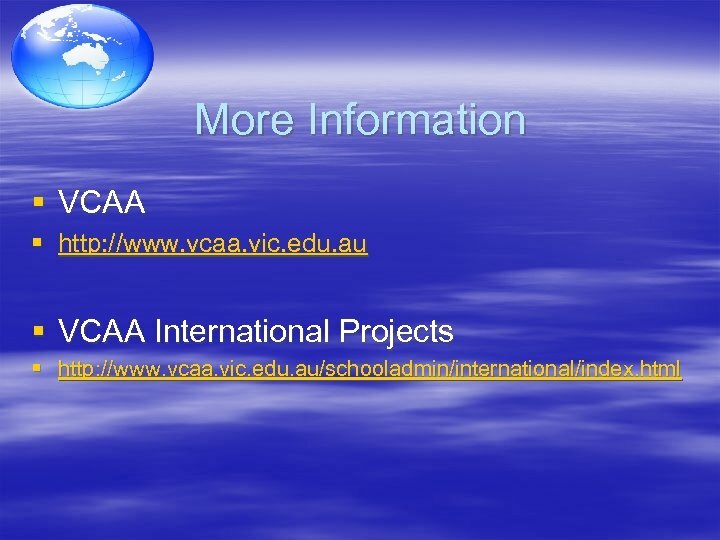 – The VCAA does not advertise or market its education programs nationally or internationally. – The VCAA does not recruit students to its programs. 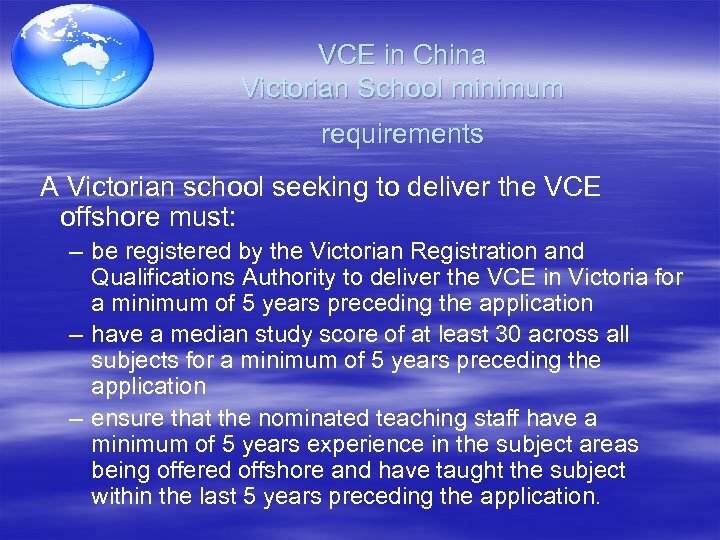 VCE in China Victorian School minimum requirements A Victorian school seeking to deliver the VCE offshore must: – be registered by the Victorian Registration and Qualifications Authority to deliver the VCE in Victoria for a minimum of 5 years preceding the application – have a median study score of at least 30 across all subjects for a minimum of 5 years preceding the application – ensure that the nominated teaching staff have a minimum of 5 years experience in the subject areas being offered offshore and have taught the subject within the last 5 years preceding the application. 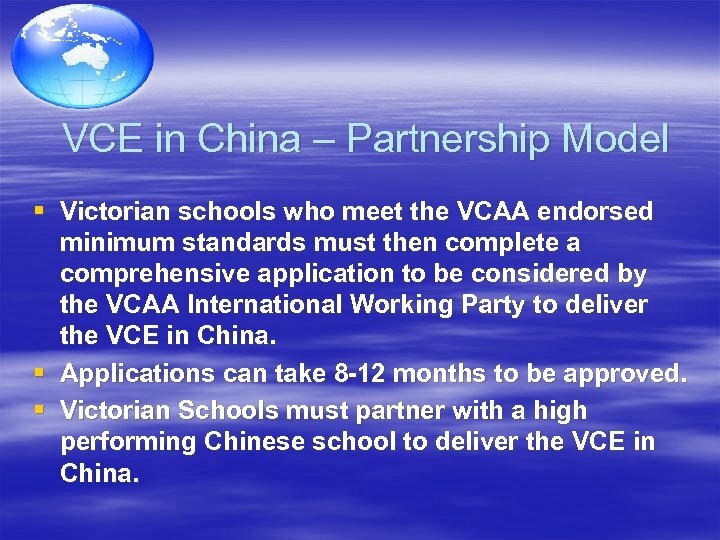 VCE in China – Partnership Model § Victorian schools who meet the VCAA endorsed minimum standards must then complete a comprehensive application to be considered by the VCAA International Working Party to deliver the VCE in China. § Applications can take 8 -12 months to be approved. 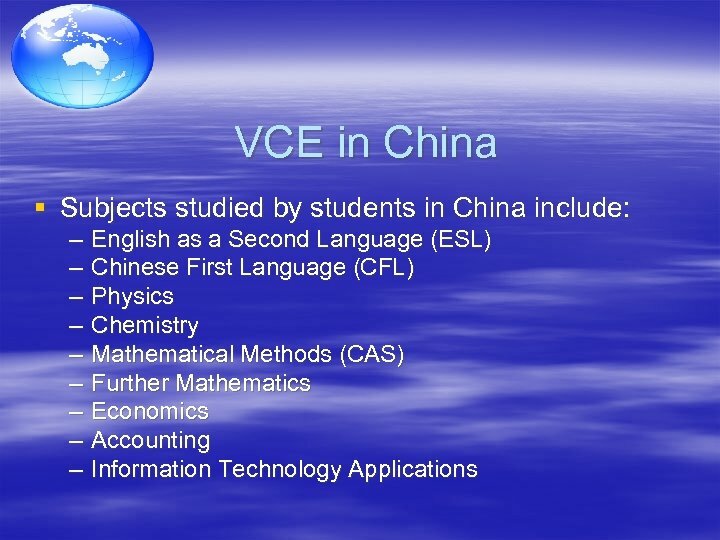 § Victorian Schools must partner with a high performing Chinese school to deliver the VCE in China. 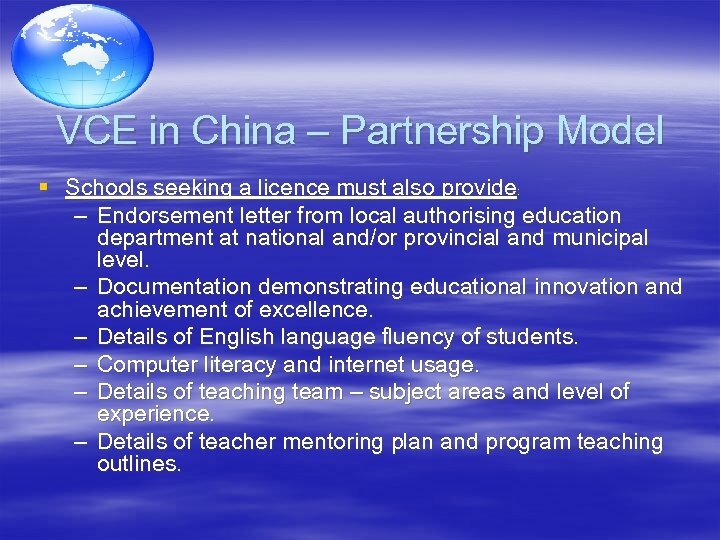 VCE in China – Partnership Model § Schools seeking a licence must also provide: – Endorsement letter from local authorising education department at national and/or provincial and municipal level. – Documentation demonstrating educational innovation and achievement of excellence. – Details of English language fluency of students. – Computer literacy and internet usage. – Details of teaching team – subject areas and level of experience. – Details of teacher mentoring plan and program teaching outlines. 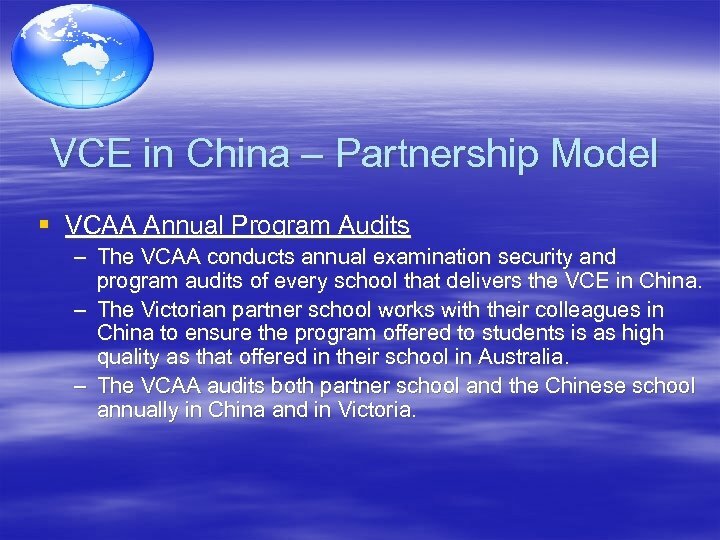 VCE in China – Partnership Model § VCAA Annual Program Audits – The VCAA conducts annual examination security and program audits of every school that delivers the VCE in China. – The Victorian partner school works with their colleagues in China to ensure the program offered to students is as high quality as that offered in their school in Australia. 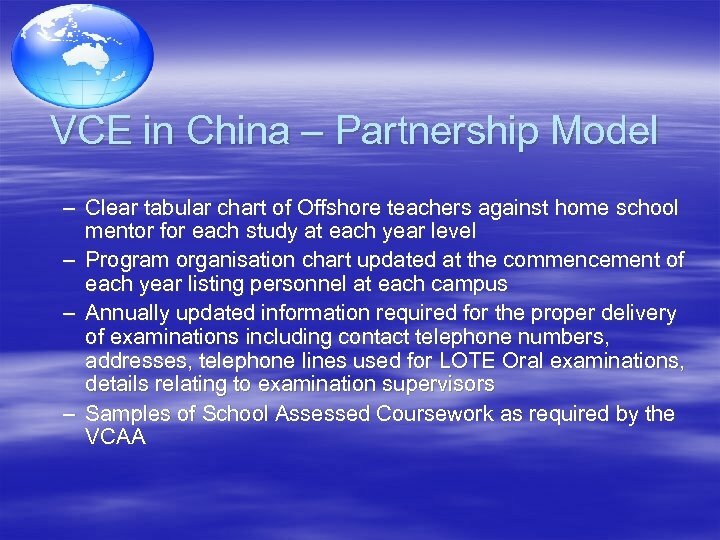 – The VCAA audits both partner school and the Chinese school annually in China and in Victoria. 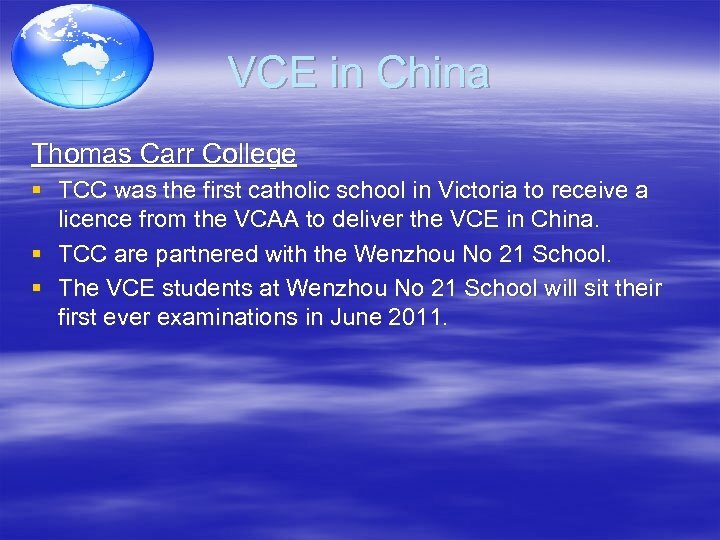 VCE in China Thomas Carr College § TCC was the first catholic school in Victoria to receive a licence from the VCAA to deliver the VCE in China. § TCC are partnered with the Wenzhou No 21 School. 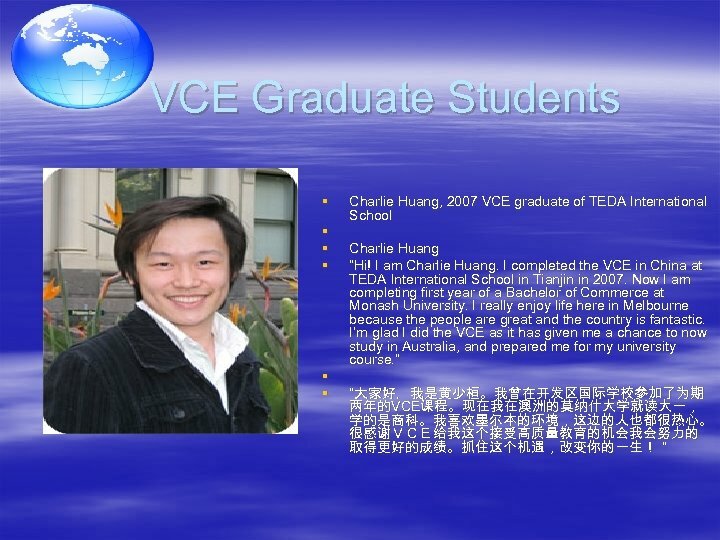 § The VCE students at Wenzhou No 21 School will sit their first ever examinations in June 2011. 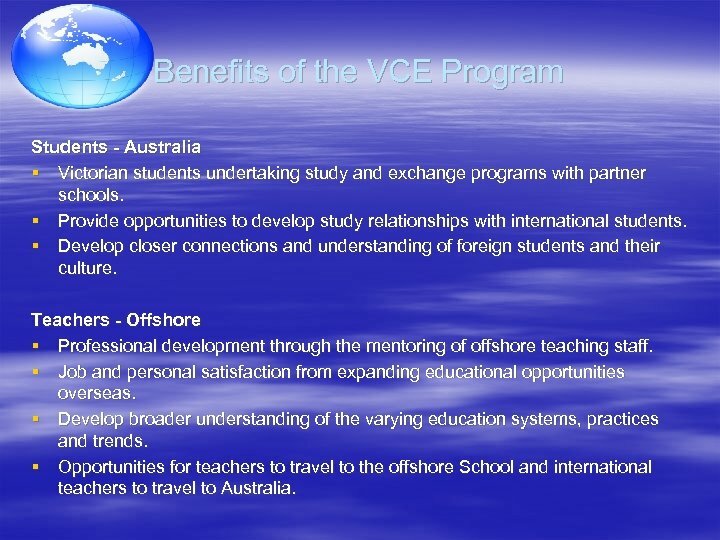 Benefits of the VCE Program Students - Offshore § Develop closer connections and understanding of foreign education systems and culture. § Provide a level of fluency in English language, higher than those students enrolled solely in the Chinese University examination, with an average IELTS level of 6 – 7. § Provide opportunity to experience a western system of education. § Access to Australian universities and other tertiary institutions to pursue further studies. § Complete both the University entrance examination and the VCE (if applicable). § Appreciation of Australian culture and values, both through VCE study and study tours to Australia. § Students do not have to relocate offshore to obtain the VCE. Benefits of the VCE Program Students - Australia § Victorian students undertaking study and exchange programs with partner schools. § Provide opportunities to develop study relationships with international students. § Develop closer connections and understanding of foreign students and their culture. Teachers - Offshore § Professional development through the mentoring of offshore teaching staff. § Job and personal satisfaction from expanding educational opportunities overseas. § Develop broader understanding of the varying education systems, practices and trends. § Opportunities for teachers to travel to the offshore School and international teachers to travel to Australia. 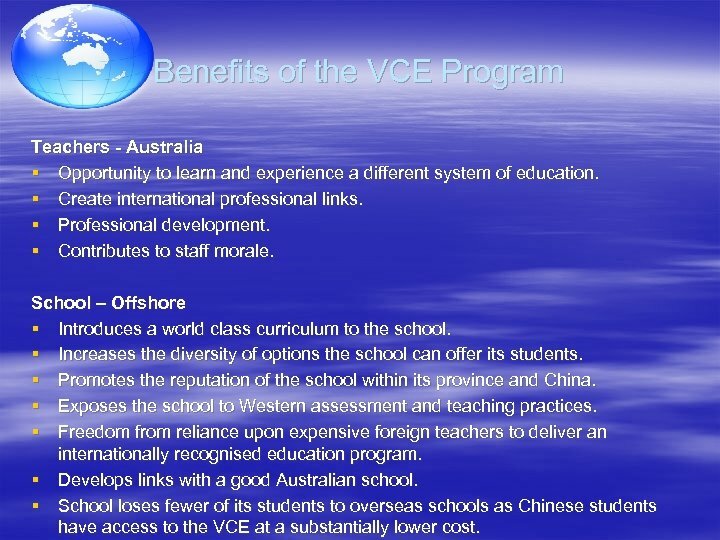 Benefits of the VCE Program Teachers - Australia § Opportunity to learn and experience a different system of education. § Create international professional links. § Professional development. § Contributes to staff morale. School – Offshore § Introduces a world class curriculum to the school. § Increases the diversity of options the school can offer its students. § Promotes the reputation of the school within its province and China. § Exposes the school to Western assessment and teaching practices. § Freedom from reliance upon expensive foreign teachers to deliver an internationally recognised education program. § Develops links with a good Australian school. § School loses fewer of its students to overseas schools as Chinese students have access to the VCE at a substantially lower cost. 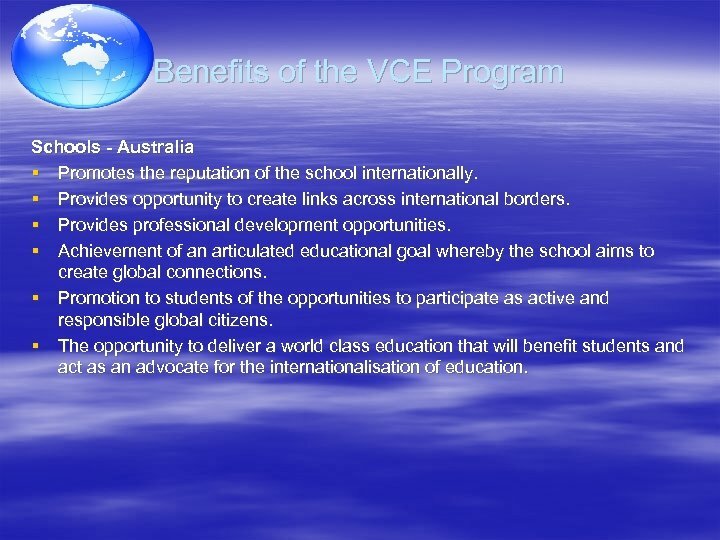 Benefits of the VCE Program Schools - Australia § Promotes the reputation of the school internationally. § Provides opportunity to create links across international borders. § Provides professional development opportunities. § Achievement of an articulated educational goal whereby the school aims to create global connections. § Promotion to students of the opportunities to participate as active and responsible global citizens. § The opportunity to deliver a world class education that will benefit students and act as an advocate for the internationalisation of education. 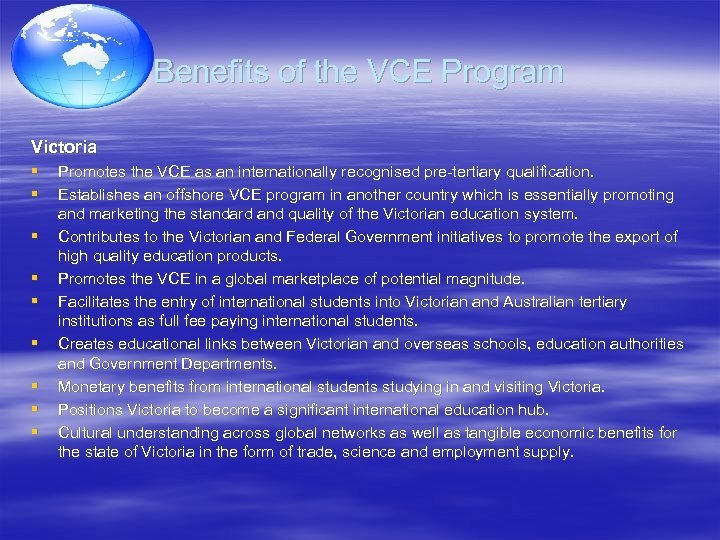 Benefits of the VCE Program Victoria § § § § § Promotes the VCE as an internationally recognised pre-tertiary qualification. 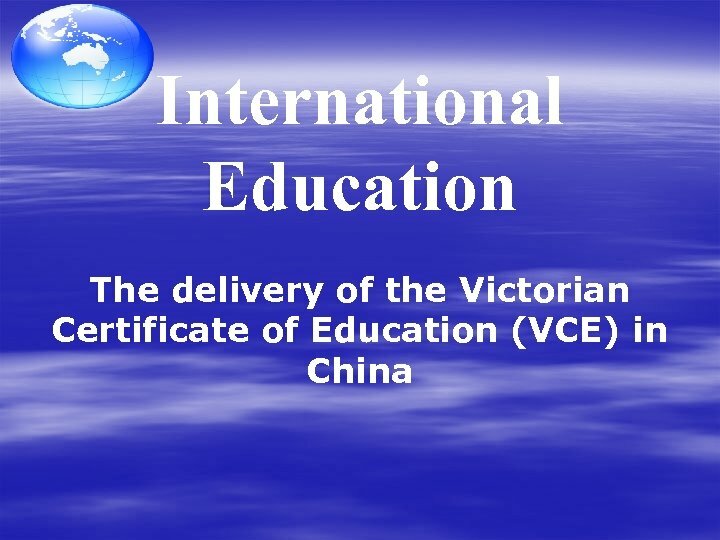 Establishes an offshore VCE program in another country which is essentially promoting and marketing the standard and quality of the Victorian education system. Contributes to the Victorian and Federal Government initiatives to promote the export of high quality education products. 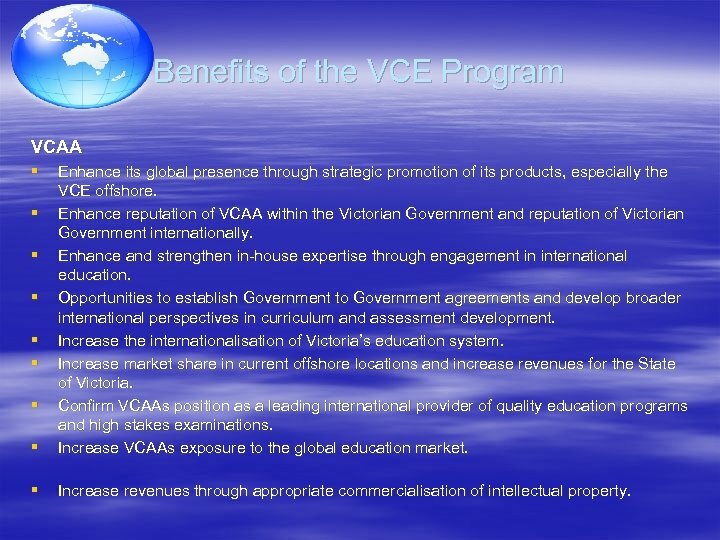 Promotes the VCE in a global marketplace of potential magnitude. Facilitates the entry of international students into Victorian and Australian tertiary institutions as full fee paying international students. Creates educational links between Victorian and overseas schools, education authorities and Government Departments. Monetary benefits from international students studying in and visiting Victoria. Positions Victoria to become a significant international education hub. Cultural understanding across global networks as well as tangible economic benefits for the state of Victoria in the form of trade, science and employment supply.